The Goldies Cricket Team played its first game against the Brilliant Cricket (B.C.C.) of Crooked Tree Village on Holy Saturday April 23rd, 2011 at the B.C.C. home ground. Vice Captain, Bobby B. Sutherland captained the game for the Goldies side and Eldon Wade captained the B.C.C. side. Brilliant won the toss and decided to bat first. The game was played for 40 overs. The B.C.C. starters did not do too well against the fast pace bowling of Bobby B., who took four wickets in his allotted eight overs, but they were able to handle the less efficient Goldies bowlers and by the time the side was retired, they had a total score of 145 runs. This was considered a low score, but turned out to be more than enough to defeat the Goldies Team, which batted all out for 77 runs. Landis ‘Ciego’ Wade top scored for the B.C.C. side with 45 runs followed by Eldon Wade with 18 runs while Melford Tillett top scored for the Goldies with 18 runs followed by Ermond Wade with 15 runs. Brandon Lewis had the most outs for B.C.C. with two wickets bowled, one caught out and one stumped. The much younger and athletic B.C.C. team with a determination to win quickly retired the Goldies open batting line up having retired the first half of the side for under 30 runs. Only veteran Captain James Rhaburn held his ground for a while against the B.C.C. open bowlers, Rodwell Conorquie and Brandon Lewis. The B.C.C. bowlers were backed up by a very lively and effective fielding side which guaranteed them an easy victory. The Brilliant team must be commended for their excellent performances that even have local supporters and spectators commenting that it was the best they have seen the team play in many years. The game was conducted in a friendly and welcoming atmosphere and attracted cricket lovers of all ages from home and abroad. Only positive comments could be heard from the promoters and spectators alike, who would like for such an event to be a yearly endeavor. Following the game, the Goldies local contacts/organizers, Elston Wade and John Gillett were asked to present awards honoring seven cricket legends from Belize, as well as medals to local players for the most outs and best batting average. Elston Wade handed out awards of recognition to Oswald Gillett, Marshall Jones, Ernest Jones and Charles Adolphus of Belize and Lisborne (Nash) Tillett, James Rhaburn and Anthony (Tido) Bennett from the USA. Brilliant’s sponsor John Gillett handed out medals to Brandon Lewis for the most outs and to Landis Wade for the most runs scored. Both John Gillett and Elston Wade were also awarded by the Goldies Team in appreciation of their effort in organizing the Belize aspect of our tour. A welcome dance was held as part of the program that same Saturday night. On the Sunday morning a second game was played at the same venue, this was a different type of match for players fifty years and older. In this match, all eleven players from each team had to bowl three overs, regardless of how painful or ugly they may look. The local over fifty team, had men from Crooked Tree, Lemonal, Carmelita, Belmopan and Lord’s Bank; while the Goldies was short and Bobby B. Sutherland and Tony Jones had to play both being under fifty year s old. None of these players were allowed to bowl fast balls for fear of injuring the older players. The local side again won the toss and batted first. Their opening batmen were quickly put away by Walter ‘Bart’ Codd, who took three wickets in his allotted three overs. However, the team made a comeback with Vernon Jones and Lyle Tillett, who were both retired not out. Lyle topped scored with 85 runs of the team total 177 runs. The Goldies won the game with 178 runs, after retiring Winfield Tillett and Tony Jones, who top scored with 90 runs not out. The game was a photo finisher with only three more balls left to bowl in the allotted overs of play. The game was followed by a domino tournament, which the local side won. 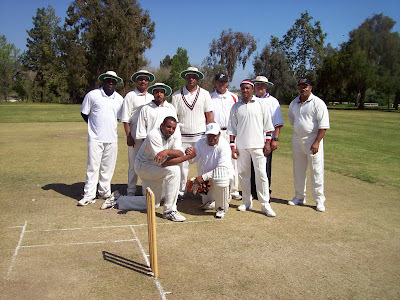 On Sunday May 1st, 2011, the Goldies will be playing against the Belize National Cricket Champion, Surprise Cricket Club at their home ground in Lemonal Village followed on Monday May 2nd, 2011 in Bermudian Landing against the Belize National Selection Team. Cricket is all about having a fun time!!!!! Thanks for the article; the photographs are beautiful.